The .303 British Service cartridge, commonly known as the .303 or .303 British was adopted by Britain along with the Lee – Metford Rifle in 1889. This round, as originally adopted, consisted of a 215 grain, round nosed, cupro nickel jacketed bullet in front of 71.5 grains of RFG2 Blackpowder. This powder charge being pressed into a pellet with both ends slightly rounded and pierced with a flash hole through the centre. There was a glazeboard wad on top of the charge to protect the base of the bullet. It initially had a small boxer type primer and was officially designated Cartridge, S.A., Ball, Magazine Rifle, Mark 1.C. Solid Case, .303inch. This round had a muzzle velocity of 1830 feet per second and a chamber pressure of about 19 tons per square inch. Cordite was used as a propellant from 1891 and the first adopted cordite cartridge, the , had a 215 grain round nosed cupro-nickel jacketed bullet giving a muzzle velocity of about 1970 feet per second at a chamber pressure of about 17.5 tons per square inch. Cordite consisted of 58% Nitro-glycerine, 37% Nitro-cellulose and 5% Mineral Jelly and was normally pressed into cord form but tubular, tape, flaked and sliced cordite were also used. Nitro-cellulose was first used as a propellant in the .303 cartridge during 1894 although it was not officially approved for service until 1916. This propellant, however, was not considered to be as stable as cordite in the tropics and cordite was, therefore, still retained as a propellant in military cartridges for the remainder of the cartridges service life. Nitro-cellulose propellant however was extensively used during the first and second world wars. 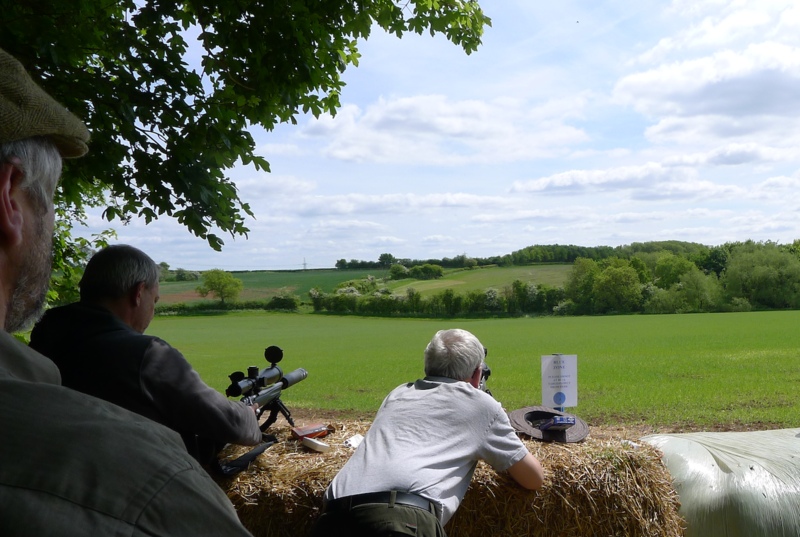 The last .303 ball cartridges manufactured at Radway Green in 1973 were loaded with nitro-cellulose powder and not cordite, cordite having last been used for the .303 cartridge in the 1960s. The round nose bullet form of the Black Powder Mark 1 and 2 and of the Cordite Mark 1 and 2 were felt by many servicemen to have less man stopping effect than the old lead .45 inch Martini bullet, the predecessor in service of the .303 cartridge. This was confirmed by experience gained in the Chitral and Tirah expeditions of 1897/98 on the North West Frontier of India where the round nose ball round compared poorly against the .303 inch Dum Dum rounds specially issued in 1897. This cupro-nickle jacketed bullet, produced at the Dum Dum ammunition factory in India, had an exposed lead nose which gave rapid expansion on impact and therefore greater wounding effect when it hit a body. Following experimentation to increase the effectiveness of the ball cartridge the British Government adopted a 215 grain cupro-nickle jacketed hollow pointed bullet in 1897 as the Similar jacketed hollow point bullets were used in the Mark IV and V rounds. These soft nosed and hollow pointed bullets were considered however to be in contravention of the St Petersburg Declaration and the Hague Convention, in 1903 they were withdrawn from active service and were afterwards to be used solely for target practice. The Mark VI round was introduced in 1904 with a 215 grain jacketed round nosed bullet similar to the Mark II bullet but with a thinner jacket. In 1910 the 174 grain pointed Mark VII bullet was adopted and the muzzle velocity was increased to 2440 feet per second. This mark of bullet remained the standard ball round for the remainder of the .303 cartridges service life. In 1938 the .303 Mark VIIIZ round was approved to obtain greater effective range from the Vickers Medium Machine Gun. This round had a nitro-cellulose powder charge with a 175 grain boat tailed, streamline, jacketed bullet having a muzzle velocity of 2550 feet per second. Chamber pressure however was higher at 20 – 21 tons per square inch compared to the 19.5 tons per square inch of the Mark VII round. Tracer, armour piercing and incendiary cartridges were adopted by the British Government during 1915, explosive bullets having been approved for service in 1916. 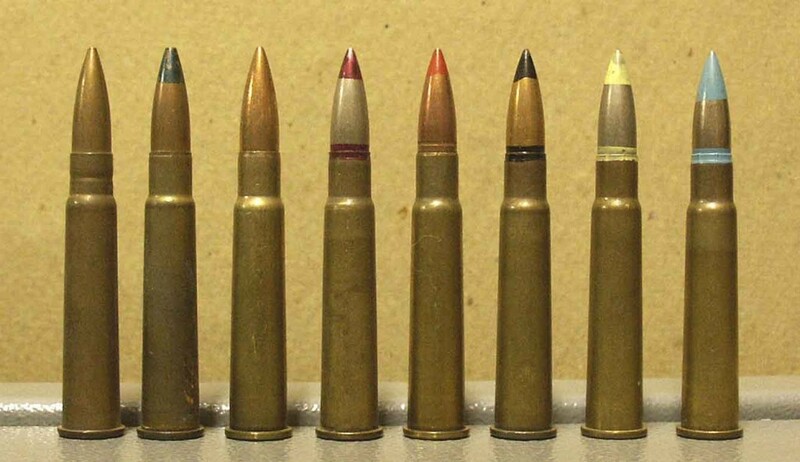 These rounds were extensively developed over the years and saw several Mark numbers. The last tracer round introduced into British service was the G Mark 8 round approved in 1945, the last armour piercing round was the W Mark 1Z introduced in 1945 and the last incendiary round was the B Mark 7 introduced in 1942. Explosive bullets were not produced in the UK after about 1933 due to the relatively small amount of explosive that could be contained in the bullet limiting their effectiveness, their role being successfully fulfilled by the use of Mark 6 and 7 incendiary bullets which were also of a less complicated construction.